First things first: Yes, Rapha is expensive and the marketing can be a bit poncy (though they’ve toned that down in recent years). 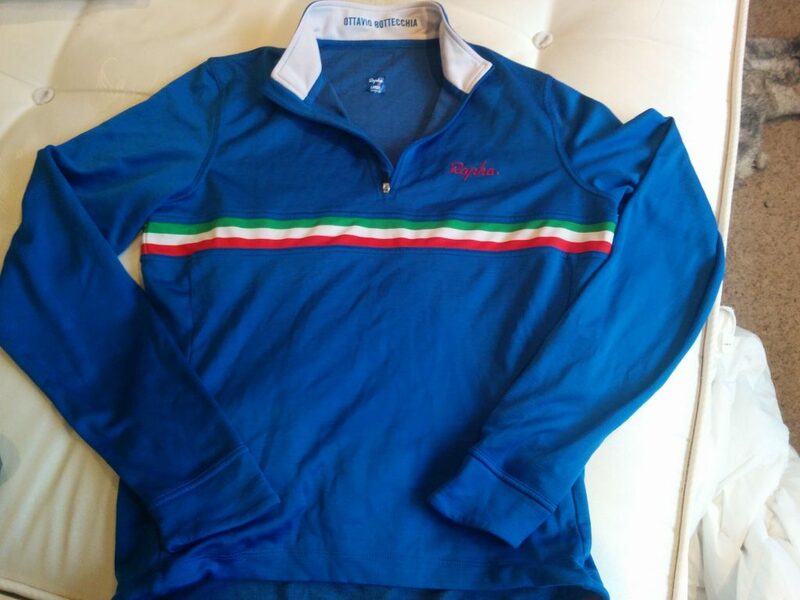 With that out of the way, I can get on with my review of the rather good-looking Country Jersey that I picked up in their sale the Christmas before last – for £60 rather than the £105 RRP. Faced with the choice of Italy or Japan, I went for the European option – and aware of the brand’s continental sizing policy, I chose large instead of medium. Made from “Sportwool”, a blend of merino and polyester, the jersey has the feel of the thick cotton rugby top I used to wear at school. Heavier than a pure polyester top but tighter woven than merino. Fit is a personal thing, but I think the cut is spot-on, close but not skin-tight and just the right length. 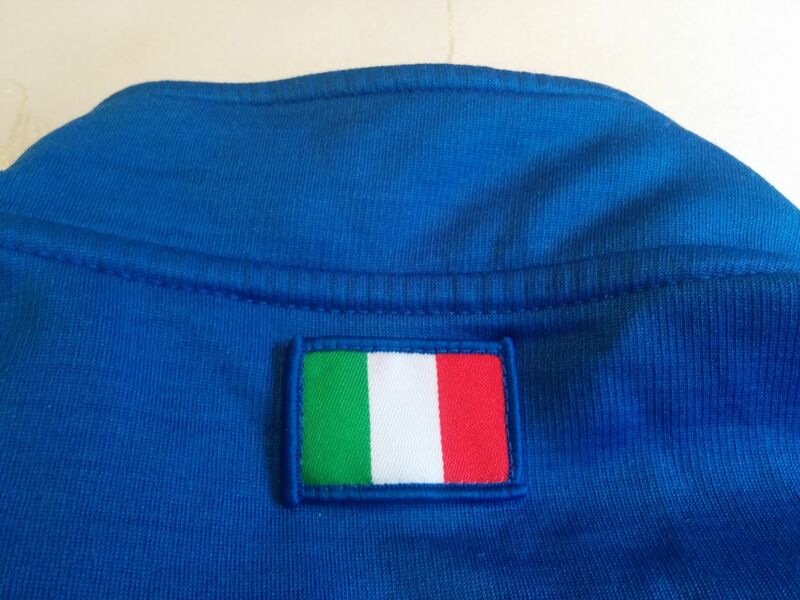 The Italian tricolour features on a band around the chest, as well as a mini-flag on the rear of the collar. 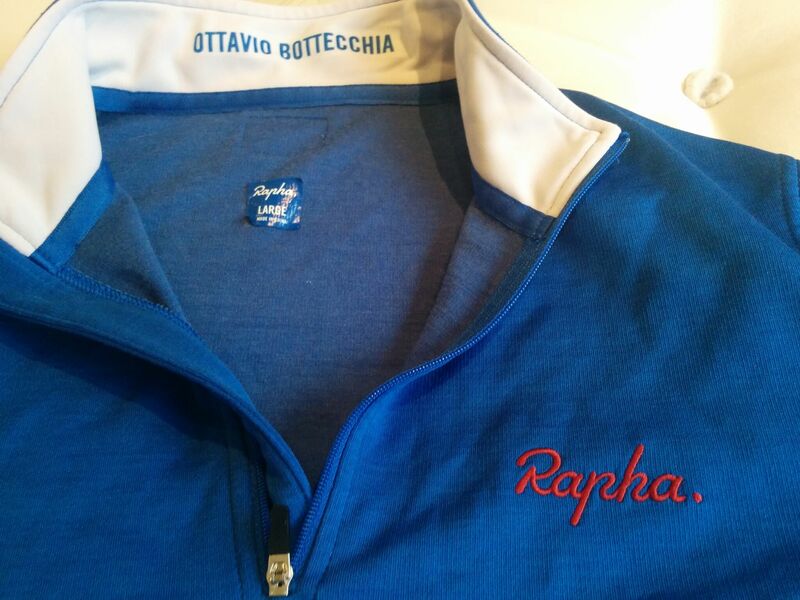 The name “Ottavio Bottachia” is printed on the inside of the collar. I’d have preferred my own name, but the first Italian winner of the Tour de France will have to do I suppose. There are three nicely-proportioned rear pockets, one of which conceals a sleeve for a mini-pump, and there’s also one of those little zipped pockets that I never, ever use. The jersey feels even better on the bike, where the long sleeves nudge up nicely to the hems of my gloves – as you sometimes want from a cool weather jersey. With a baselayer underneath it’s good down to about five degrees – provided the wind isn’t blowing too much – and on it’s own it’s fine up to the mid-teens. I often wear it for a cool spring or autumn evening ride. The technical fabric does appear to combine the best elements of merino and polyster, giving warmth but still wicking well and not going damp and clingy with sweat after a hard effort. Is it worth the RRP? That depends on how much money you’ve got and what value you place on design and technical features – but at the discount price it was a veritable bargain.